Among the records of the Admiralty Court of York, held at the Borthwick Institute, is a collection of Constable's Returns of Seamen, under reference DRP/Adm CT. It appears that the Admiralty, under the Lord High Admiral, required regular updates of potential mariners in case of war. The surveys were carried out via the Admiralty's Marshall for Yorkshire, and were addressed to the constables of the townships adjoining the navigable rivers of Yorkshire. 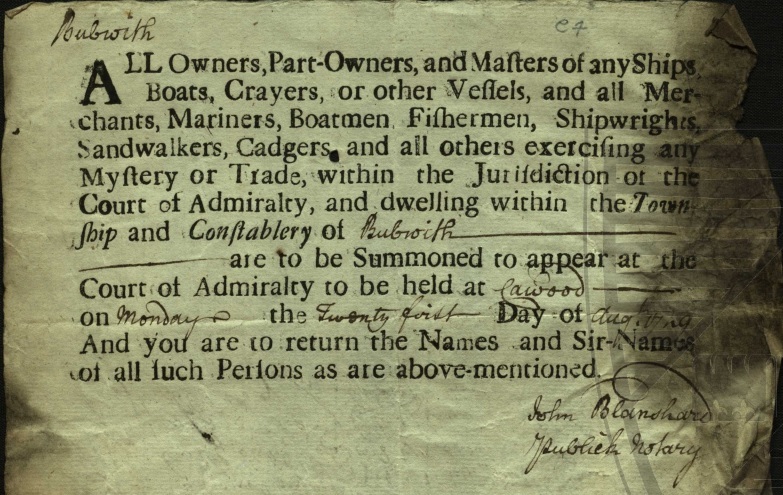 The requests for returns were printed and signed by one of the notaries working in the Admiralty Court in York. These may certifie whom it may concern that Mr William Skelton formerly had the fourth part of a vessel but he hath sold it to Rowland Petter of Barmby at most 2 years ago.